This section presents the work plan structure of the project as well as the deliverables to be produced. Public deliverables are available upon request through our contact section. Ensuring that all foreseen project activities will be properly implemented according to the working plan and the budget limits. Providing effective coordination and communication among the partners and with the steering committee. Ensuring proper project management and make sure that all project objectives and milestones are successfully achieved. Guarantee that all legal, contractual, financial and reporting obligations are respected. Assess risks and take action to tackle them during the whole project length. Submit the required project reports and act as connection point among partners and the EU Commission. To identify new and emerging markets where the tourism and hence the hospitality sector is expected to boost in the next years. To obtain relevant information about how the contract-hospitality sector and its value chain work in those identified markets. 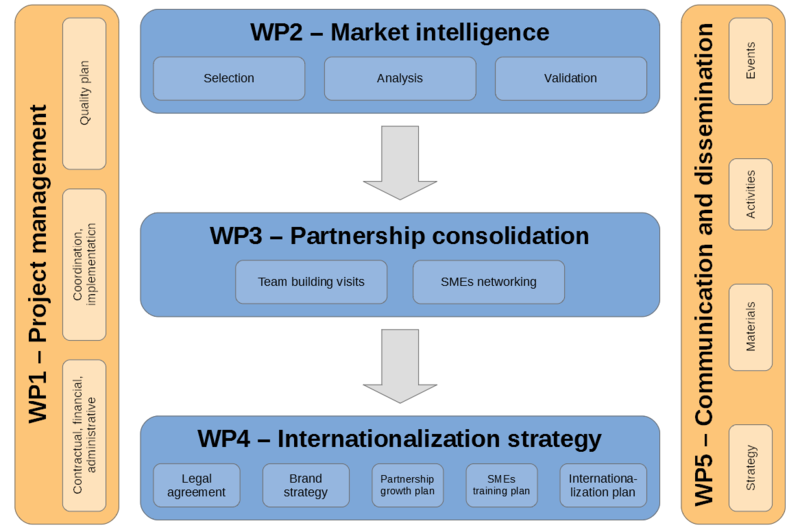 To understand who are the main competitors of the partnership clusters SMEs members working in the target markets. Motivate and involve all Partnership members to participate in all planned activities. Increase the knowledge of each participating cluster in relation to other clusters’ activities, relevant internationalization practices and experiences, different expertise available in each cluster, parts of the Hospitality sector value change covered by other clusters members, etc. Increase the capacities of all clusters members to successfully enter markets outside of the EU by delivering relevant information and example of successful practices. Create the basis for boost collaboration among the clusters and among the cluster members. Promote the creation of consortiums of SMEs with complementary products and services. To establish a legal partnership agreement to regulate the relationship among the consortium members. To develop a joint marketing strategy in order allows cluster members to gain international visibility. To create a common identity: naming, logo, available to the cluster members. To establish an international roadmap to be implemented in a second project phase. Deliver a communication and dissemination strategy to properly reach the different target groups with the right messages and information. To reach the partnership clusters and their member SMEs in the building, furnishings, ICT and smart technologies, water management and energy efficiency industries and deliver them relevant information about project activities, deliverables, achievements and opportunities. To reach those other clusters from industrial sectors complementary to the SENTINEL partnership ones to deliver them about the project and its achievements. To reach the public in general to disseminate information about the project activities and achievements. Carry-on the dissemination planned actions in an effective manner to properly involve all the partnership clusters and their SMEs in the project activities. Increase the awareness about project outcomes, outputs and opportunities within the partnership and among the SMEs clusters members. Increase the understanding of participating clusters and their SMEs members of the selected markets through the different dissemination activities.